Offices of the top management of Škoda Auto are situated in an unusually designed building, dubbed “The Pentagon”. The interiors, however, are anything but military – a lot of light, modern furniture in nice colors, and many well-kept plants. 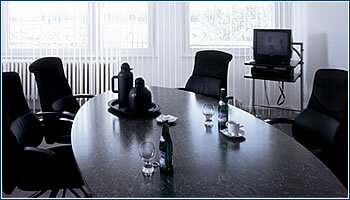 The office of Vratislav Kulhánek, chairman of the board, exemplifies the general ambience. 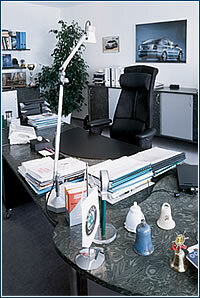 Standing lamps from the German company Erco illuminate the office indirectly, which makes it more comfortable. They are equipped with metalhalogen bulbs that produce light similar to daylight, while dimmers regulate the intensity of the light.. 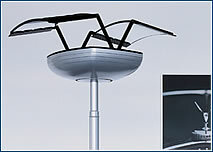 The mobile furniture Act was developed and registered by our company architect Vlastimil Pacek and his colleagues. The desks were custom-made, using a grey-green veneer from the Italian firm ALPI. I selected the chairs from the Scandinavian firm Häg. 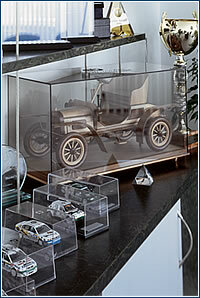 Modern times are represented by various models of the Rally version of Octavia, while tradition is recalled by a wooden, hand-made model of Laurin Klement from 1906. Behind you can see one of goblets that I won; I have driven rally since 1972. The philosophy was to make the office calm and at the same time practical for meetings, so I have chosen mostly quiet colors. Also something personal must be included, because I spend a lot of time here. On the other hand, visitors must see the tradition and unity of the company. The handles made of steel rope covered with plastic are flexible, and don’t hurt if you bump into them. 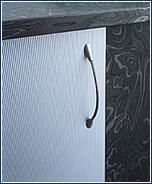 This element, a speciality of our architects, is also used for hanging the shelfs. I needed a clock that would fit with the interior. 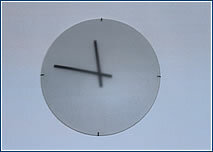 This truly unusual “DK clock” came from the workshop of Dutch designer Paul Schudel.